This major study, to which several well-known scholars contributed, tells the fascinating story of the first great necropolis to be laid out near London. It explains the growth of the movement to found cemeteries (influenced by developments in France and by considerations of urban hygiene), the establishment in 1832 of the General Cemetery Company (which still owns and manages the Cemetery), and the endeavours by architects and landscape designers to create an attractive place of burial. 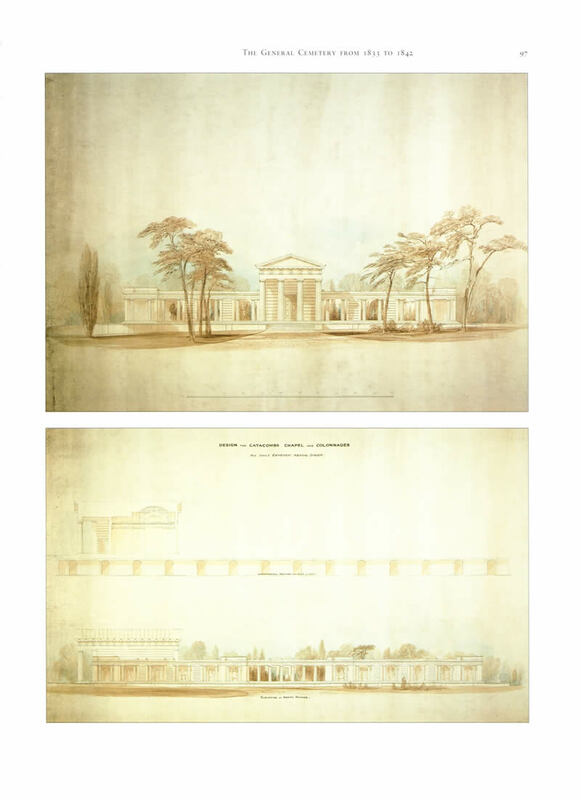 An architectural competition was held in 1831-2, quickly followed by the laying out of the grounds and erection of the first of several distinguished buildings. The greater part of the Cemetery was consecrated in 1833. Based on the archives of the Company, and drawing on the expertise of its several authors, this important book makes a considerable contribution to urban history and coemeterial studies. Covering a vast range of topics, written in accessible form, it is copiously illustrated: many of the pictures (some of which are photographs specially taken for the book) have never previously been published. 'Beautifully illustrated with faultless captions, scrupulously indexed, foot-noted, and referenced, this book is for the academic and the enthusiast... Curl, ... our leading cemetarian ..., has produced a book based on exhaustive archival research: it is a commentary on every aspect of Victorian London'. 'This must be the first time that a cemetery, even a famous cemetery, has been recorded with such loving care. Every detail of its genesis, development, architecture, ecology, and geology seems to be included. The fullness of the text is matched by that of the footnotes... Readers will be surprised as well as instructed... Indeed the story sometimes reads like a novel with its fair share of cliffhangers. Will the Bishop consecrate? Or will George Stephenson’s railway destroy the site? There is even a wicked Baronet... who nearly brought the whole enterprise down with his firm’s spectacular bankruptcy in 1855. Was all the labour [on the book] worthwhile? The answer must be a resounding yes'. 'This magnificent book is largely the work of the distinguished original members of the Friends of Kensal Green Cemetery… It is edited by James Stevens Curl, who is responsible for the lion’s share of the chapters and for the meticulous standard of research. He begins with the historical and literary background to the cemetery movement and then traces the creation of the General Cemetery Company… The competition for the buildings and layout was, as usual in the nineteenth century, far from straightforward, the winning Gothic scheme by Henry Kendall being supplanted by a Greek Revival one by the little-known John Griffith. Curl follows the financial ups and downs and personal clashes of the General Cemetery Company — a story almost as gripping as a novel by Dickens or Galsworthy. 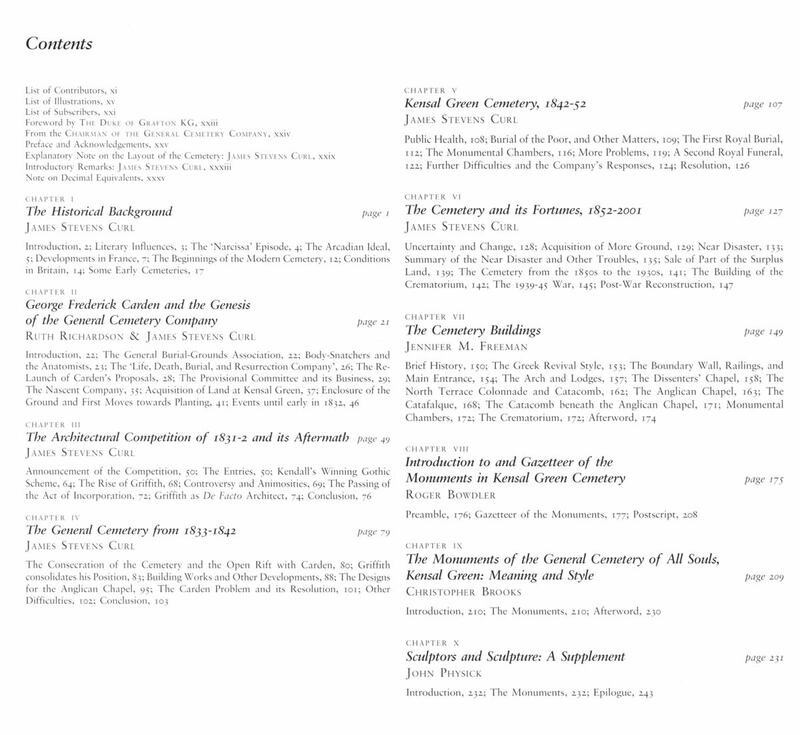 Other chapters cover every possible aspect of the cemetery, showing what a rich experience it can offer… The book is handsomely laid out with many photographs and drawings, and apt quotations head each chapter. There can be few, if any, cemeteries in the world which have had such a superb book devoted to them, and all those involved with it should feel justifiably proud'. 'a beautifully produced book… with excellent illustrations. Masterminded by James Stevens Curl, the in-depth essays cover every aspect from geology to architecture'. 'This magnificent book... must surely now be the most extensive monograph ever devoted to a single cemetery anywhere in the world, and will repay close study for years to come. It is the result of the prodigious efforts of its Editor, Professor James Stevens Curl, who has gathered many specialist hands to examine in detail almost every aspect of the cemetery’s history and changing fortunes, from the founding of the company to the present day... The many plans, archive illustrations and photographs also make it a feast for the eye... many images, particularly of monuments and sculptures ... have rarely, if at all, been published before. The scrupulous attention to detail evidenced by Curl, in what appears to have been a very short... time from commission to publication, means that all of the chapters maintain a very high standard of detail and quality'. '… handsomely produced, lavishly illustrated (many photographs are by that first-rate architectural photographer, Martin Charles), and full of interesting material'. '...the first study of a single London cemetery from all points of view – historical, architectural and artistic, and conservationist'. 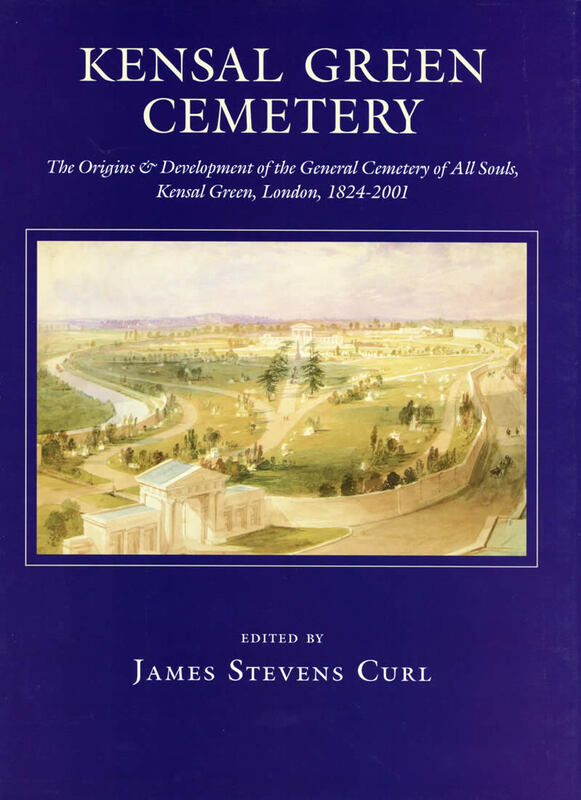 'This magnificent book tells the full story of the General Cemetery of All Souls at Kensal Green, London… Never before has a cemetery in Britain earned or deserved a document of this quality and detail'. 'The definitive account. 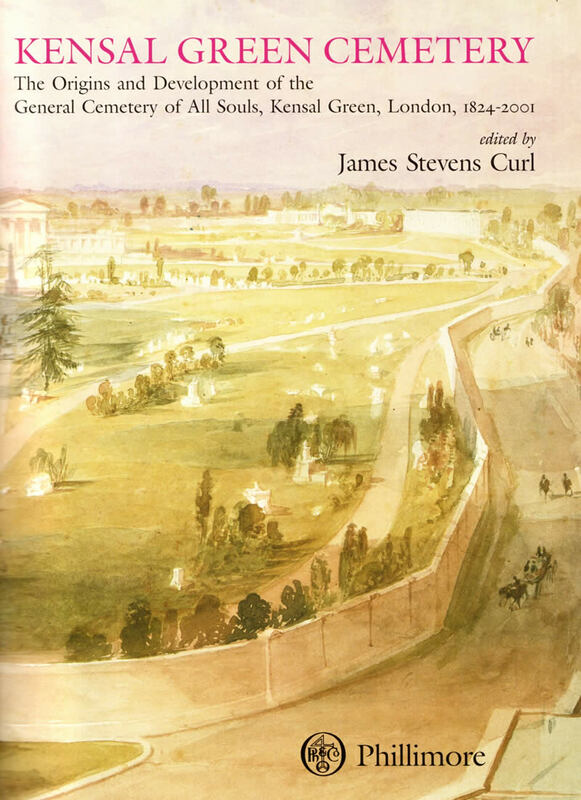 An outstanding book offering the last word on the cemetery’s history, its buildings, its memorials, the inscriptions, geology and landscape and, indeed, flora and fauna'.